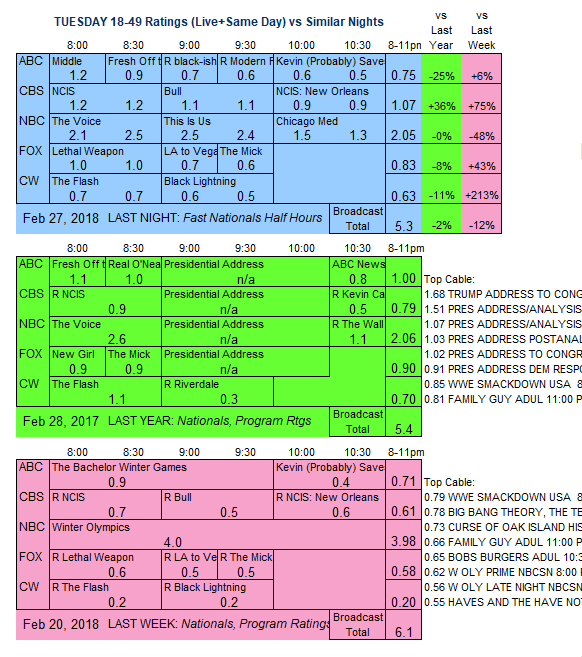 Several of Tuesday’s shows returned from the Olympics break a bit lower than they left. NBC: THE VOICE was at 2.3, down 0.3 from its first midseason Tuesday airing last year. THIS IS US dropped 0.2 from its last pre-Olympics episode to 2.5, and CHICAGO MED was down 0.1 to 1.4. ABC: THE MIDDLE (1.2) and FRESH OFF THE BOAT (0.9) were steady with their pre-Olympics episodes. 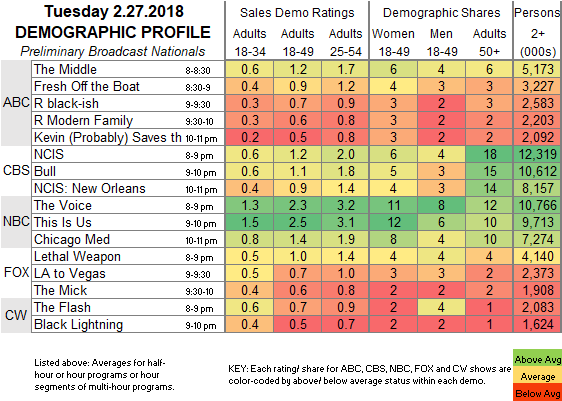 After a 0.7/0.6 hour of reruns, KEVIN (PROBABLY) SAVES THE WORLD held at its pre-Olympics 0.5, although it was up 0.1 from last week’s hour that aired during the Games. CBS: NCIS fell 0.3 from its pre-Olympics episode to tie its series low at 1.2, BULL was down 0.1 to 1.1, and NCIS: NEW ORLEANS remained at 0.9. FOX: The entire line-up was down 0.1 from pre-Olympics levels: LETHAL WEAPON to 1.0, LA TO VEGAS to 0.7, and THE MICK to 0.6. CW: THE FLASH tied its series low 0.7 (down 0.1 from its last episode), and BLACK LIGHTNING was down 0.1 to 0.5. CBS’s SURVIVOR begins its latest cycle tonight.